The Official Choo Yilin blog. Discover timeless heirloom pieces masterfully crafted for the sophisticated women of today. Contrary to popular belief that Jade is only worn for conspicuously traditional weddings, this precious gemstone has proven to be quintessential for the discerning modern day bride. The most coveted of them all, the iconic Choo Yilin Jade Bangles. Jade is, historically, an incredibly significant East-Asian icon. It’s mentioned in almost every piece of traditional Chinese literature and has been revered for being a symbol of protection and love. In traditional Chinese culture, this gemstone is believed to be a living thing that protects and heals one's spirit and body. It is believed that one's personal jade bangle possesses the ability to protect it's wearer from harm and will break or chip as it takes the brunt of a possible fall or injury. Furthermore, the colour green in jade also signifies balance, wealth, fertility, luck, harmony and long life - qualities that are essential for every happy marriage. A collection that is a marvel of carefully chosen array of glittering gems and tasteful luxuriance. The Bamboo collection that triumphantly exudes both feminine and minimalist charms. The hallmark of our Si Dian Jin is none other than our use of Type A Burmese Jadeite and the exquisite designs of our jewellery pieces. Designed to match the day-to-day wardrobe of the modern bride, we believe that jewellery withholding such precious memories and significance are deserving to be proudly worn on a daily basis. 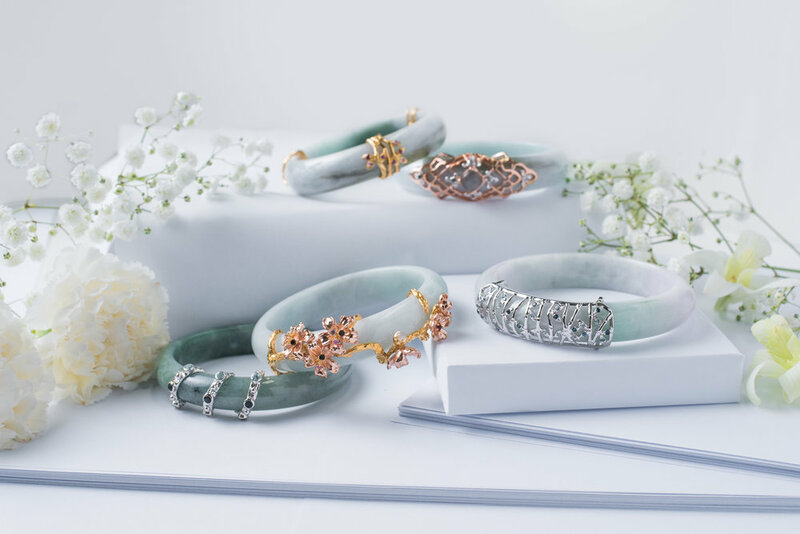 With Si Dian Jin's great cultural influence on Chinese Weddings, the traditional roots of this customary practice is conserved through our signature jade pieces with delicate metalwork and beloved gemstones. The Choo Yilin bride that exudes sophistication and beauty. Add a touch of tradition to your wedding gowns with our classic Jade jewellery. Incorporating key heritage-rich elements such as the revered oriental Jade in your wedding, especially your tea ceremony, lends a meaningful and significant touch to your wedding day. A go-to option for its strong heritage and timeless look, it is something that your traditional elders would appreciate. At the crux of the Choo Yilin brand DNA is the values of heritage perseverance and conservation, and so we began on the journey to modernise Jade which carries centuries of emotional and cultural significance. We hope that our modern interpretations of Jade Jewellery attempts to challenge the present notion of heirloom pieces and reinvents an Asian icon into a jewellery staple. Don’t be a stranger - you’ll be hearing from us soon.